Get the perfect gift for the “Star Trek” fan in your life — a Hikaru Sulu ornament signed by George Takei. The actor will be at the Japanese American National Museum’s store, 100 N. Central Ave. in Little Tokyo, on Sunday, Dec. 9, from 1 to 2 p.m. to sign these Hallmark ornaments depicting him as the legendary character. 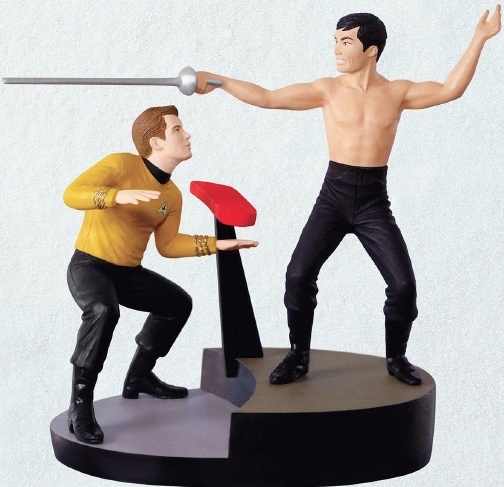 Featuring dialogue from the unforgettable “Star Trek” episode “The Naked Time” (1966), the ornament shows a bare-chested Sulu with a fencing foil as he challenges Captain Kirk and other crew members on the bridge of the USS Enterprise. In the episode, crew members contract a disease that causes them to reveal their inner selves; in Sulu’s case, he fancies himself as a swordsman, like one of the Three Musketeers. Cost: $29.99. This product is available for purchase in-store only; no online or mail order sales are permitted. Takei is making this appearance in support of the museum, so he will be signing only items purchased at the JANM Store. Photos with Takei are available only with store purchase.